Amphipods comprise an order of crustacea, shrimp-like in form, which contains mostly marine and freshwater forms. While some species are terrestrial, they still require moist habitats. These terrestrial species are sometimes referred to as "lawn shrimp" due to their similarity to true shrimp. Figure 1. As seen by the red color, this amphipod, or "lawn shrimp" is dead. Photograph by University of Florida. Amphipods were first described in New South Wales, Australia, and then later on several Pacific islands. They were first reported in the Western Hemisphere in 1918 when at least one species was found in California (Mallis 1990). About 90 species occur in the United States and Canada. Nationally, the best known terrestrial species that occasionally invades structures is Arcitalitrus sylvaticus (Haswell) (McLaughlin et al. 2005, Smith and Whitman 1992). Two species common to Florida are Talitroides topitotum (Burt) (W. Cranshaw, personal communication, 30 June 2011) and Talitroides allaudi (Chevreux). Amphipods are elongate and more or less compressed laterally. They do not have a carapace (the hard covering of the thorax common in other crustacea), and seven (rarely six) of the thoracic segments are distinct and bear leglike appendages. The abdominal segments are more often or less fused, and so the thoracic segments make up most of the body (Borror et al. 1989). They have two pairs of antennae, with one pair usually very small. The eyes usually are well developed, but are sometimes reduced or lacking. Members of this order have chewing mouthparts (Smith and Whitman 1992). Adult amphipods range from 5 mm to 20 mm (3/16 to 3/4 inch) in length. Arcitalitrus sylvaticus (Haswell) reaches a length of 8 mm (3/8 inch), Talitroides topitotum are 7 mm in length and Talitroides allaudi about 3.5 mm. Aquatic species are often whitish but are seen in other colors also. The color of terrestrial species varies from pale brown to greenish to brownish black when alive, but they often turn red when they die. 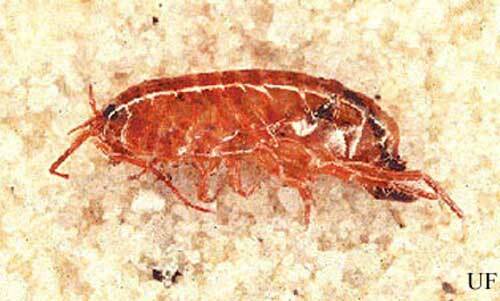 Amphipods are sometimes misidentified as springtails (Insecta: Collembola). Springtails are also very commonly found in moist areas, sometimes in vast numbers. However, springtails are not crustacea, but insect-like arthropods with only three pairs of legs, one pair of antennae and usually a furcula (a forked structure) on the 4th abdominal segment. The group of springtails that might be confused with amphipods also has a tubular structure on the last abdominal segment. Eggs are deposited within a brood pouch on the underside of the adult female amphipod's body. The eggs hatch in one to three weeks. The young amphipods resemble the adults and leave the pouch during the next one to eight days when the female has her first molt during mating. The molt usually takes about one hour. And most species complete their life cycle (egg to adult) in one year or less (Smith and Whitman 1992). Most species produce only a single brood of eggs, but in at least one aquatic species, Hyalella azteca, the females average 15 broods over a five month period. Hyalella azteca is common in aquatic systems and is used by scientists as an indicator of environmental health and water quality in streams, lakes, and other bodies of water. Figure 2. Hyalella azteca is a 1/4-inch-long amphipod that is common in aquatic systems. Photograph by Scott Bauer, USDA. Many amphipods, like those called beach fleas, live on the beach, where they occur under stones or decaying vegetation. Most amphipods are scavengers. Mallis found amphipods living under ivy used as ground cover. Here they jumped about like fleas and were difficult to capture. 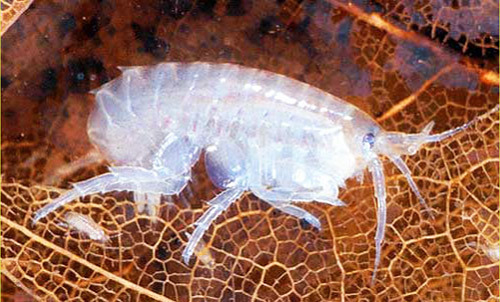 Amphipods are present in soft ground up to a depth of 13 mm. Leaf mold beneath shrubbery also offers a suitable habitat for terrestrial amphipods (Mallis 1990). Terrestrial amphipods live on the surface (top 1/2 inch) of mulch and moist ground. After rains, large numbers of amphipods can migrate into garages or under the doors of houses. There they soon die. Amphipods do not have a waxy layer on their exoskeleton as do insects. They lose or gain moisture from their environment. Too much of a water loss results in desiccation while too rapid a gain is also lethal. This is why they migrate out of rain-soaked soil to drier areas where they usually end up dying anyway. Most species are active at night. Terrestrial amphipods require a moist environment and die quickly in the drier environment found within structures or on drying pavements. Once dead, they turn a reddish color. They may be safely swept or vacuumed up and discarded. There are no labeled insecticidal recommendations for control. 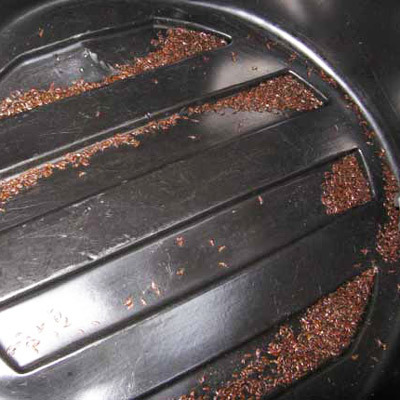 Some texts suggest "any spray labeled for indoor control of cockroaches," but most professionals have switched to baits for cockroach controls and these have no effect on amphipods. Spot treatment of doorways with a residual contact insecticide will accelerate amphipod mortality in homes. Figure 3. Masses of dead, terresterial amphipods in the bottom of a small artificial landscape pool. The amphipods turned red in color upon death. Photograph by Tess Hart-Ross. If amphipods are a continual problem on sidewalks, pavements or within open structures after heavy rains, then steps should be taken to dry out the mulch or ground cover near these areas by turning it or reducing irrigation to decrease existing populations. This is similar to the practice used to control fungus gnats in indoor ornamental plantings. Weather stipping on the bottom of doors helps in keeping amphipods from entering structures. Amphipods can cause problems for pool owners. During rainy weather, large numbers can be found in swimming pools and clog pool filters. Regular cleaning of filters during this period is the only solution. Borror DJ, Triplehorn CA, Johnson NF. 1989. An Introduction to the Study of Insects. Harcourt Brace Jovanovich Publishers. 875 pp. Lowry JK, Springthorpe RT. (September 2001). Amphipoda: Families. Crustacea.net. http://www.crustacea.net/crustace/amphipoda/index.htm (January 2018). Lowry J. (December 2010). Arcitalitrus sylvaticus (Haswell, 1879). World Register of Marine Species. http://www.marinespecies.org/aphia.php?p=taxdetails&id=555665 (January 2018). McLaughlin PA, Camp DK, Angel MV, Bousfield EL, Brunel P, Brusca RC, CadienD. 2005. Common and Scientific Names of Aquatic Invertebrates from the United States and Canada: Crustaceans. American Fisheries Society Special Publication 31. pp. 545. Pinto LJ. 1990. Occasional Invaders. In Handbook of Pest Control. Story K, Moreland D (eds.). Franzak & Foster Co. Cleveland. 1990. pp. 833-867. Smith EH, Whitman RC. 1992. Field Guide to Structural Pests. National Pest Management Association. Dunn Loring, VA. Publication Date: July 2001. Latest revision July 2011. Reviewed January 2018.